"Daimones" is the recipient of the 2012 PRG Award Reviewers' Choice in Science Fiction and the 2013 Hall of Fame, Best Science Fiction by Quality Reads UK Book Club in collaboration with OrangeBerry Book Tours. "Daimones" by Massimo Marino is an apocalypse book with a difference. One night the world’s population quietly died, except for Dan, his wife Mary and their teenage daughter. The mass extinction was so quiet that it was only on the commute to work in Geneva that Dan noticed that something was amiss. Then with mounting alarm they discover that all the people around them are dead and that all the old certainties in life have vanished. 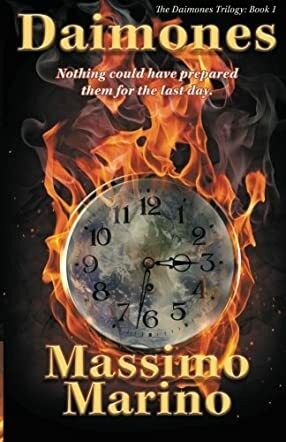 Dan works quickly to protect his family’s short-term and medium-term safety and only then can he start to work out the means to test the premise that everybody else in the world is dead. Finally they get a response though it is a rambling paranoid message which trips Dan and his family into a paranoid survival mode almost sabotaging their first human contact. The new survivor joins the family and the group dynamics change. Dan continues to search for other survivors and makes a key discovery about the mystery of the extinction while searching for survivors with the facilities at CERN. This is a good book. It is attractively written and the language flows well. "Daimones" explores some difficult themes. For instance, what would be your reaction when you find that more and more of the people and structures of your society are gone? At what point will you cross over from respecting the laws and customs of civilization to fending for yourself? The main character in the book had the space to develop as their roles changed in the new world. Yet the plot didn’t tire but shifted gear to an exciting finish. The evocation of the rich and expensive city of Geneva surrounded by commuter towns in France is especially well done. A great read; well done Massimo.